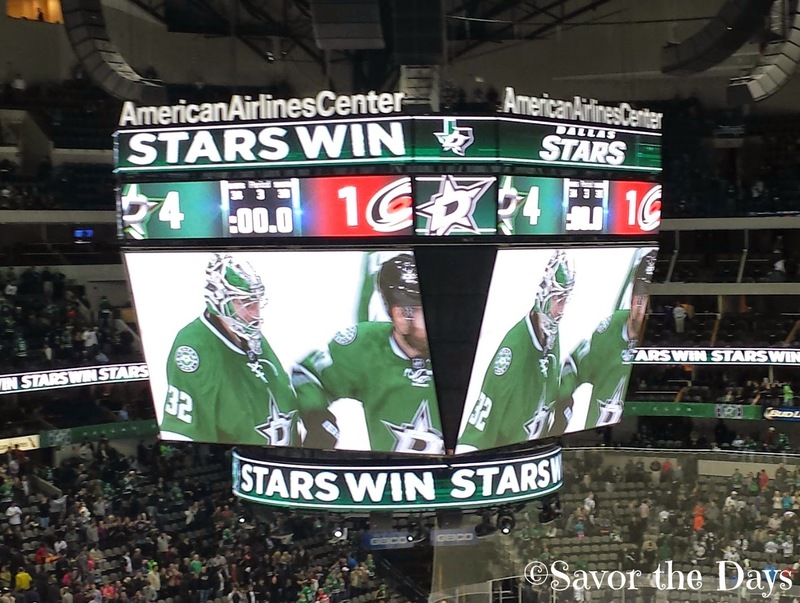 Savor The Days: Dallas Stars Win...with a Taco Goal! We don't get to go out for many date nights these days. When you factor the cost of dinner, entertainment, and childcare it is just too expensive to justify doing very often. But every now and then one of Stuart's co-workers offers him two tickets to a Dallas Stars hockey game. She is a season ticket holder and if she can't go she just gives the tickets away. Stuart called me late this afternoon to let me know that he just got these two free tickets to tonight's game against the Carolina Hurricanes. How could we resist? But the game wouldn't end until about 10:00 and its in Dallas but our usual childcare facility closes at 10:00 and it isn't very close to where the game is played. So I quickly called our two options for babysitters. One was going to the game herself and the other wouldn't be available until about 7:00 which is much too late to try to bother going to the game then. So we figured out a way to make it all work. The kids would start the evening at the childcare facility then when the babysitter was available at 7:00 she would pick the kids up and bring them back to the house. She was fine to stay with them as late as we needed her to. Whew! It was a scramble to get all of this in place and still get out the door to make it to Dallas in time for the game but it all worked out. My first attempt at a "selfie" as we looked for our seats in the arena. 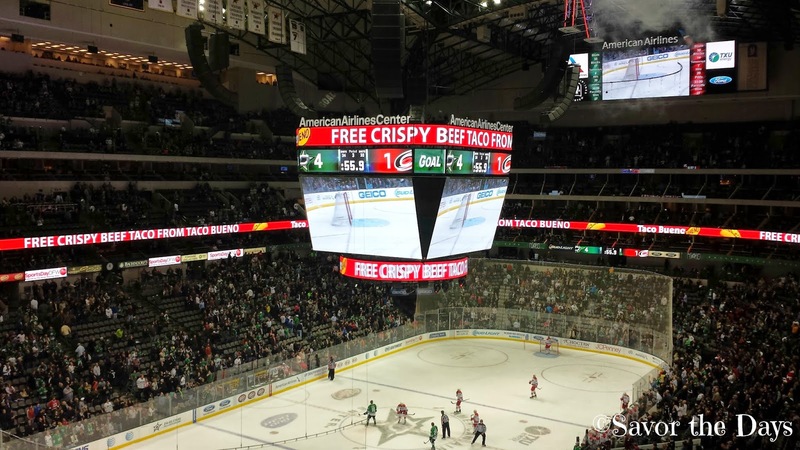 When the Stars score a goal in the 3rd period everyone wins a coupon for a free taco at Taco Bueno. Yay! They scored a "taco goal" and with less than a minute to go in the game. I don't know why I get so excited about taco goals because Taco Bueno doesn't even have the greatest tacos but it sure is fun seeing all the excitement at the game about it. 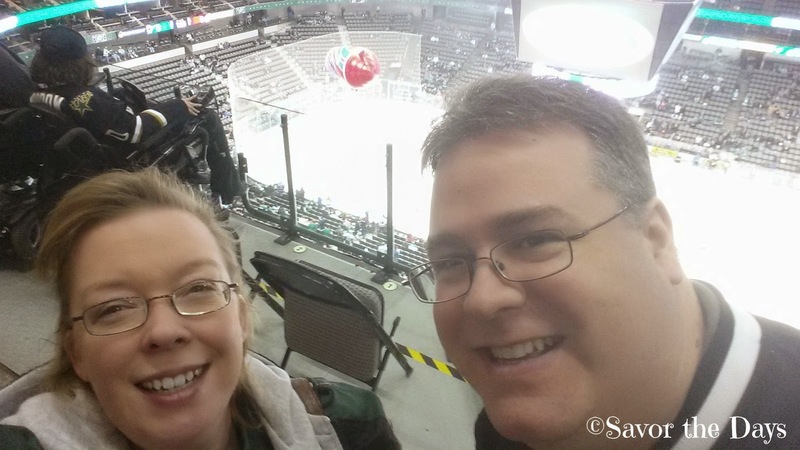 The Stars won 4 to 1 which only made our date night even better.